Historical incidents such as foreign invasions, trade relations and colonialism have also played a role in introducing certain foods to the country. For instance, potato, a staple of Indian diet was brought to India by the Portuguese, who also introduced chillies and breadfruit. Indian cuisine has also shaped the history of international relations; the spice trade between India and Europe is often cited by historians as the primary catalyst for Europe’s Age of Discovery. 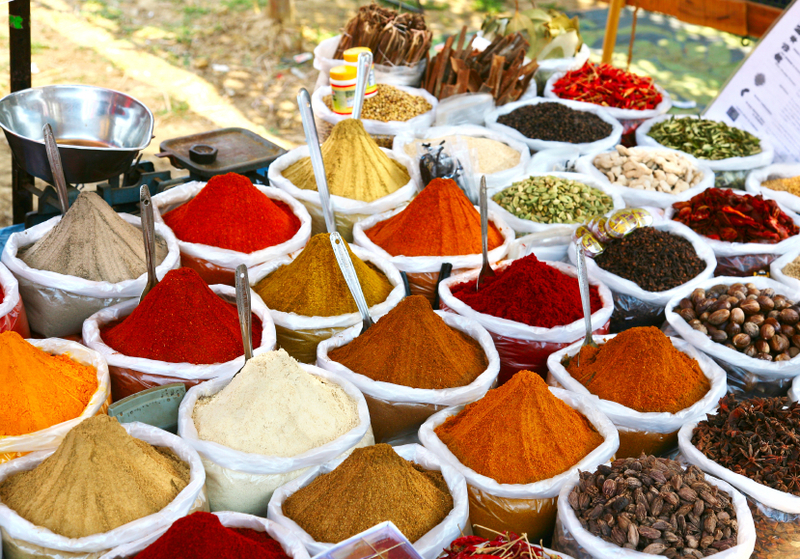 Spices were bought from India and traded around Europe and Asia. It has also influenced other cuisines across the world, especially those from Southeast Asia, the British Isles and the Caribbean. Indian cuisine reflects a 5000-year history of various groups and cultures interacting with the subcontinent, leading to diversity of flavours and regional cuisines found in modern-day India. 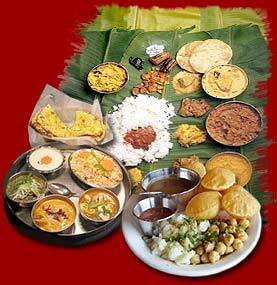 Later, mughals, British, and Portuguese influence added to the already diverse Indian Cuisine. During the Middle Ages, several North Indian dynasties were predominant, including the Gupta dynasty. Travellers to India during this time introduced new cooking methods and products to the region, including tea and spices. Northern India was later invaded by Central Asian cultures, which led to the emergence of Mughlai cuisine, a mix of Indian and Central Asian cuisine. Hallmarks include seasonings such as saffron. Staple foods of Indian cuisine include pearl millet (bajra), rice, whole-wheat flour (atta), and a variety of lentils, especially masoor (most often red lentils), toor (pigeon pea), urad (black gram), and moong (mung bean). Lentils may be used whole, dehusked—for example, dhuli moong or dhuli urad—or split. Split lentils, or dal, are used extensively. 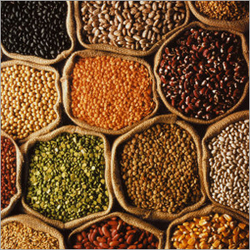 Some pulses, such as channa (chickpea), Rajma or kidney beans, lobiya are very common, especially in the northern regions. Channa and mung are also processed into flour (besan). Many Indian dishes are cooked in vegetable oil, but peanut oil is popular in northern and western India, mustard oil in eastern India, and coconut oil along the western coast, especially in Kerala. Gingelly (sesame) oil is common in the south since it imparts a fragrant nutty aroma. In recent decades, sunflower and soybean oils have become popular across India. Hydrogenated vegetable oil, known as Vanaspati ghee, is another popular cooking medium. Butter-based ghee, or desi ghee, is used frequently, though less than in the past. The most important and frequently used spices and flavourings in Indian cuisine are whole or powdered chilli pepper (mirch) (introduced by the Portuguese in the 16th century), black mustard seed (sarso), cardamom (elaichi), cumin (jeera), turmeric (haldi), asafoetida (hing), ginger (adrak), coriander (dhania), and garlic (lehsun). One popular spice mix is garam masala, a powder that typically includes five or more dried spices, especially cardamom, cinnamon (dalchini), and clove. Each culinary region has a distinctive garam masala blend—individual chefs may also have their own. Goda masala is a comparable, though sweet, spice mix popular in Maharashtra. Some leaves commonly used for flavouring include bay (tejpat), coriander, fenugreek, and mint leaves. The use of curry leaves and roots for flavouring is typical of Gujarati and South Indian cuisine. Sweet dishes are often seasoned with cardamom, saffron, nutmeg, and rose petal essences. Cuisine differs across India’s diverse regions as a result of variation in local culture, geographical location (proximity to sea, desert, or mountains) and economics. It also varies seasonally, depending on which fruits and vegetables are ripe. great issues altogether, you just won a new reader. What could you suggest about your post that you simply made some days in the past? Any sure? wonderful points altogether, you simply gained a brand new reader. What would you suggest in regards to your post that you just made some days ago? Any certain? I have been exploring for a bit for any high-quality articles or weblog posts on this kind of area . Exploring in Yahoo I at last stumbled upon this web site. Reading this information So i am glad to convey that I have a very excellent uncanny feeling I found out just what I needed. I most unquestionably will make certain to don¡¦t disregard this website and give it a look regularly. Simply want to say your article is as surprising. The clearness in your post is simply great and i could assume you’re an expert on this subject. Fine with your permission allow me to grab your feed to keep up to date with forthcoming post. Thanks a million and please continue the enjoyable work. I¡¦ve learn some excellent stuff here. Definitely price bookmarking for revisiting. I surprise how a lot attempt you set to make such a wonderful informative web site. Helpful information. Lucky me I found your site accidentally, and I am stunned why this coincidence didn’t came about earlier! I bookmarked it. Fantastic goods from you, man. I’ve understand your stuff previous to and you’re just too wonderful. I really like what you have acquired here, really like what you’re saying and the way in which you say it. You make it entertaining and you still care for to keep it sensible. I cant wait to read much more from you. This is actually a terrific website. Somebody necessarily lend a hand to make seriously articles I’d state. That is the first time I frequented your website page and thus far? I amazed with the research you made to create this actual publish amazing. Great process! What i don’t realize is in reality how you are now not actually a lot more well-appreciated than you might be right now. You’re so intelligent. You understand thus significantly in relation to this topic, produced me in my view consider it from a lot of various angles. Its like women and men aren’t interested until it is something to accomplish with Lady gaga! Your personal stuffs excellent. All the time maintain it up! I am now not sure where you’re getting your info, but good topic. I must spend a while finding out more or working out more. Thanks for wonderful info I was in search of this information for my mission. I’ve been browsing online more than three hours today, yet I never found any interesting article like yours. It抯 pretty worth enough for me. In my opinion, if all webmasters and bloggers made good content as you did, the internet will be a lot more useful than ever before. Wow, amazing blog layout! How long have you been blogging for? you make blogging appear easy. The all round look of your web-site is fantastic, let alone the content! or perhaps your family, an amount they be. Hello.This article was extremely fascinating, particularly since I was searching for thoughts on this matter last Saturday. Hello, Neat post. There is an issue along with your site in web explorer, could test this¡K IE still is the marketplace chief and a big element of other folks will miss your wonderful writing because of this problem. Thanks for sharing superb informations. Your web-site is so cool. I’m impressed by the details that you have on this site. It reveals how nicely you perceive this subject. Bookmarked this web page, will come back for more articles. You, my friend, ROCK! I found just the information I already searched everywhere and just could not come across. What a great web-site. You have to join in a contest for certainly one of one of the most valuable blogs on the net. I will suggest this website! Somebody necessarily help to make significantly posts I would state. That is the first time I frequented your web page and to this point? I amazed with the research you made to make this particular post amazing. Wonderful activity! I truly wanted to develop a quick note to be able to say thanks to you for the superb strategies you are writing at this site. My prolonged internet lookup has at the end been paid with really good information to write about with my friends and classmates. I ‘d declare that many of us site visitors are extremely fortunate to be in a useful site with many lovely individuals with helpful concepts. I feel very grateful to have discovered your entire webpage and look forward to so many more enjoyable minutes reading here. Thanks a lot once more for everything. I would like to thank you for the efforts you’ve put in writing this site. I am hoping the same high-grade web site post from you in the upcoming as well. Actually your creative writing abilities has inspired me to get my own web site now. Actually the blogging is spreading its wings fast. Your write up is a great example of it. I simply wanted to thank you very much yet again. I’m not certain the things that I would’ve followed without the smart ideas documented by you directly on such a subject matter. It previously was a depressing dilemma in my opinion, nevertheless witnessing your skilled tactic you treated the issue forced me to leap with joy. I’m just thankful for your service and thus hope you find out what an amazing job you are always undertaking educating men and women through a blog. Probably you’ve never come across all of us. I must point out my gratitude for your generosity for men who must have help with this one idea. Your personal dedication to passing the message all through ended up being remarkably valuable and has usually permitted women like me to arrive at their targets. Your own insightful suggestions signifies a great deal to me and even further to my peers. Thank you; from each one of us. I do consider all the concepts you’ve introduced on your post. They are very convincing and will certainly work. Still, the posts are very quick for starters. Could you please extend them a bit from subsequent time? Thanks for the post. naturally like your website however you have to test the spelling on quite a few of your posts. Many of them are rife with spelling issues and I to find it very bothersome to tell the truth nevertheless I¡¦ll surely come again again. Excellent post. I was checking continuously this blog and I am impressed! Very useful information particularly the last part I care for such information much. I was seeking this particular info for a very long time. Thank you and best of luck. The information and facts mentioned in the write-up are several of the top offered. great issues altogether, you simply won a brand new reader. What may you suggest in regards to your put up that you simply made a few days ago? Any sure? I found your weblog site on google and examine a number of of the early posts. Proceed to sustain up the quite superior operate. I basically additional up your RSS feed to my MSN Details Reader. Looking for forward to studying extra from you in a although!? I’m usually to running a weblog and i basically respect your content. The write-up has genuinely peaks my interest. I’m going to bookmark your web page and hold checking for brand new data. I do believe all of the concepts you have introduced on your post. They’re very convincing and can certainly work. Still, the posts are very short for novices. May you please lengthen them a bit from subsequent time? Thank you for the post. Someone necessarily help to make seriously posts I would state. This is the first time I frequented your web page and up to now? I surprised with the analysis you made to make this actual post amazing. Wonderful activity! I just wanted to develop a simple comment so as to appreciate you for the great secrets you are giving out here. My extended internet look up has finally been honored with good insight to go over with my best friends. I would suppose that many of us readers are undeniably lucky to live in a great network with many awesome people with very beneficial methods. I feel truly fortunate to have used your entire webpage and look forward to many more pleasurable minutes reading here. Thank you once again for everything. Wonderful website. A lot of useful information here. I am sending it to some pals ans additionally sharing in delicious. And obviously, thank you in your effort! Hello, Neat post. There’s a problem together with your website in internet explorer, would check this¡K IE still is the market leader and a huge element of people will miss your wonderful writing because of this problem. A person essentially lend a hand to make critically articles I would state. This is the very first time I frequented your website page and to this point? I amazed with the research you made to make this particular post extraordinary. Wonderful process! My husband and i ended up being delighted when Emmanuel managed to do his homework with the ideas he came across while using the blog. It’s not at all simplistic to simply find yourself freely giving steps which often many others may have been selling. And we all figure out we now have you to be grateful to for this. The entire explanations you made, the straightforward website navigation, the friendships your site make it possible to instill – it’s got many terrific, and it’s really assisting our son in addition to our family recognize that that matter is exciting, and that is exceedingly vital. Thank you for all the pieces! It’s a shame you don’t have a donate button! I’d certainly donate to this superb blog! I guess for now i’ll settle for bookmarking and adding your RSS feed to my Google account. I look forward to new updates and will share this website with my Facebook group. Talk soon! magnificent points altogether, you simply received a emblem new reader. What may you suggest about your put up that you simply made some days ago? Any certain? Thanks for the advice on credit repair on all of this site. A few things i would advice people is usually to give up the particular mentality they can buy today and pay back later. As being a society many of us tend to try this for many factors. This includes getaways, furniture, and items we would like. However, you need to separate your wants from all the needs. As long as you’re working to boost your credit score make some trade-offs. For example you are able to shop online to economize or you can look at second hand retailers instead of highly-priced department stores intended for clothing. You actually make it appear really easy together with your presentation however I to find this matter to be actually something that I think I’d by no means understand. It sort of feels too complex and very wide for me. I’m looking forward to your subsequent publish, I will try to get the hang of it! Hello, Neat post. There is a problem with your website in internet explorer, would check this¡K IE nonetheless is the market leader and a huge section of folks will pass over your great writing due to this problem. Thank you a lot for sharing this with all folks you really recognize what you are speaking approximately! Bookmarked. Kindly additionally talk over with my website =). We can have a link exchange contract between us! Great awesome things here. I am very satisfied to look your post. Thanks so much and i’m looking forward to touch you. Will you kindly drop me a e-mail? It¡¦s actually a great and helpful piece of info. I am happy that you just shared this helpful info with us. Please stay us up to date like this. Thanks for sharing. Thank you a lot for sharing this with all of us you actually realize what you’re speaking approximately! Bookmarked. Kindly also talk over with my site =). We could have a hyperlink alternate contract among us! This seriously is an extremely amazing powerful resource that you are providing and you just provide it away cost-free!! I comparable to discovering internet websites that view the unique price of supplying you lovely understanding resource for zero cost. We really dearly loved examining this web site. Be thankful! My programmer is trying to convince me to move to .net from PHP. I have always disliked the idea because of the expenses. But he’s tryiong none the less. I’ve been using Movable-type on numerous websites for about a year and am anxious about switching to another platform. I have heard great things about blogengine.net. Is there a way I can transfer all my wordpress posts into it? Any help would be greatly appreciated! You can definitely see your expertise within the work you write. The world hopes for more passionate writers such as you who aren’t afraid to mention how they believe. All the time go after your heart.